"Nanoscience is fashionable. All administrations in the Western world have stressed their interest in nano-objects and nanotechnologies. The aim of the present handbook is to help us with the tools by suitable modelizations. It is written by leading experts, starting from general theoretical principles and progressing to detailed recipes. Soon after the first wave, including this handbook, a certain form of nano-industry may be born." The future applications of nanotechnology in high-tech industries require deep understanding of the theoretical and computational aspects of all kinds of materials and devices at a nanometer scale. Handbook of Theoretical and Computational Nanotechnology is the first single reference source ever published in field that offers such an unified approach covering all of the major topics dealing with theory, modeling, design and simulations of nanostructured materials and nanodevices, quantum computing, computational chemistry, physics and biology, nanomechanics, nanomachines, nanoelectronics, nanoprocesses, nanomagnetism, nano-optics, nanomedicines, nanobiotechnology, etc. This 10-volume (ca. 8,000 pages) handbook provides the first ideal introduction and an up-to-date survey of the fascinating new developments and interdisciplinary activities in the whole field presented by scientists working in different subject areas of science, engineering and medicine. This handbook is the most profound publication on this topic- the first treatment of the computational nanotechnology. This outstanding handbook presented by 265 world's leading scientists, is the most significant academic title ever published in this research field. 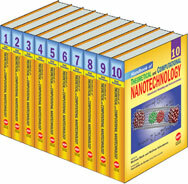 This handbook has been divided into 10 thematic volumes by documenting computational treatment of nanomaterials and nanodevices. Atomic Design, Atomistic Modeling, Quantum Computers, ab Initio Methods, Atom Nano-optics, Computational Nanoelectronics, Computational Nanotechnology, Molecular Devices, Molecular Machines, Nanosurfaces, Bio-Molecular Motors, Molecular Motors, Molecular Dynamics, Meshfree Methods, Density Matrix Renormalization Method, Finite Element Method, Maxwell Solvers, Bionanotechnology, Embedded Atom Method, Tight-Binding Molecular Dynamics Method, Computational Modeling, Statistical Mechanical Modeling, Linear-Scaling Quantum Mechanical Methods, Equivalent-Continuum Modeling of Nanomaterials, Self-consistent P3M Simulation of Ion Channels, Multiscale Simulations of Nanomaterials and Nanodevices, Hierarchical Models of Nanomechanics and Micromechanics, Computational Nanomechanics of Materials, Nanotribology, Adhesion, Nanoindentation, Nanoscale Fracture Processes, Transport Phenomena, Proton and Electron Tranfer Processes, Flow Modeling in Fullerenes and Nanotubes, Atomistic Modeling of Nanoprous Materials, Nano-thermodyanamics, Quantum Chemistry, Computational Biology, Protein Folding, Computational Studies of DNA and RNA, Enzymes, Enzyme-Mimetics, Enzyme-Catalyzed Reactions, Nanomagnetics, Medical Nanorobotics, Biological Nanotubes, Design of proteins, Nanomedicines, Drug Design and Delivery, Ligand Docking, Computational Models for Genetics and Neurogenetics, Neuro-Genetic Information Processing, Nonlinear Optical Properties of Carbon Nanostructures, Optical Properties of Nanoclusters and Semiconductor Nanostructures, Modeling of Photonic Crystals and Nanostructures, Quantum Optics, Theoertical Physics, Computational Micromagnetics, Magnetic Nanomaterials and Nanodevices, Self-Assemblies, Modeling of Polymer Nanocomposites, Carbon Nanotube Composites, Diamonds, Fullerenes and Endofullerenes, Carbon Nanocones, Doped Nanomaterials, Superconducting Nanostructures, Embedded Quantum Dots and Nanowires, Molecular Wires, Nanocrystals, Computer Simulation of Surfaces, Conjugated Organic Polymers, Monte Carlo Simulations, Nano-thermodynamics of Surfaces, Mechanical Properties of Polymer-Carbon Nanotube Composites, Single and Multi-Wall Carbon Nanotubes, Ferroelectric Nanostructures, Silicon-Based Nanodevices, Single-Electron Devices and Nanocircuits, Single-Electron Transistors, Quantum Dot Lasers, Modeling of Nanodevices, Modeling of MEMS and NEMS, Biomechanism, Nanomedicines, Computational Chemistry, Quantum chemistry, Molecular Design, Nanomedicines and Nanodrugs design, Computational methods and Simulation Techniques from ab initio to Multiscale, Algorithms, Nanoscale Analysis of Defects, diffusion, Cascades, and Irradiation, Nanomembranes, Nanocatalysis, Nanometals, Polymer Nanostructures, Liquid Crystals, Nanocolloids, Monolayer and Multilayers, Tthin Films, Nanoengineering and Nanodesign Nano-CAD, Luminescence, Computational Methods for Simulating Quantum Computers, Wigner Function Based Device Modeling, etc. The World's first handbook ever published in the field of theoretical and computational nanotechnology . The first comprehensive reference dedicated to all disciplines of science, engineering. and medicine. Most up-to-date reference source drawing on the past two decades of pioneering research. About 140 Review chapters written by world leading scientists familiar with the current trends of nanotechnology. 8,000 pages written by 265 authors from 30 countries, truly international. 26,000 references, 4124 figures, 374 tables, and thousands of mathematical equations and formula. Clearly written, self-contained, timely, authoritative, and most comprehensive contributions. Extensive cross-refereeing in each chapter provides reader with a broader range of knowledge. Multidisciplinary reference source for students, scientists, engineers, biologists, medical experts and related professionals. This handbook is an invaluable reference source for scientists, engineers and biologists working in the field of theoretical and computational nanotechnology and for individual research groups, libraries in the universities and industrial institutions, government, independent institutes, R&D and defense research laboratories. The handbook is intended for a broad audience working in the fields of quantum chemistry, physics, biology, materials science, medicine, electrical and electronics engineering, mechanical engineering, optical science, ceramic and chemical engineering, device engineering, aerospace engineering, computer science and technology, information technology, bioinformatics, biotechnology, medical sciences, surface science, polymer science and engineering. Dr. Michael Rieth is a Research Scientist at the Institute of Materials Research I(IMF-I) in the Forschungszentrum Karlsruhe, Germany since 2002. He is Head of the consulting company AIFT, Karlsruhe since 1987. He worked as a Researcher at the Institute of Materials Research II (IMF-II), Forschungszentrum Karlsruhe from 1995-99 and at the Engineering Science Department of University of Patras (Greece) from 1999-2000. He was Product Manager at AMA-Systems, Pforzheim, Germany from 2000-01. He received his M.Sc. (germ. Dipl. Ing.) degree in Electrical Engineering from the University of Karlsruhe in 1991 and his Ph.D. in Physics from the University of Patras (Greece) in 2001. Dr. Rieth published 23 research articles in refereed journals, two book chapters and four patents. He is the author of Nano-Engineering in Science and Technology (World Scientific, 2003), and was the Editor-in-Chief of the Journal of Computational and Theoretical Nanoscience (2004-2005). His main scientific interests are in atomistic modeling of metallic nanosystems and materials development for advanced fusion reactor applications. Professor Dr. Wolfram Schommers is a Theoretical Physicist presently working at the Research Center of Karlruhe in Germany. He is also Professor of Theoretical Physics, Professor of Physics and Materials Sciences and Distinguished Professor in Europe, China and USA. He began his studies of Theoretical Physics at the Technical University of Munich, and continued his course-work at the University of Münster, receiving a Diploma in Physics. After a brief intermezzo in the industry, Prof. Schommers joined the Research Center of Karlsruhe. He received his Ph.D. (Dr. rer. nat.) in Theoretical Physics from the University of Karlsruhe. Prof. Schommers' scientific activities are concentrated on Computational and Theoretical Physics. His main fields of interest include Foundations of Physics, Liquids, Solids and Gases, Superionic Conductors, Surface Science, and Nanophysics as the basis for the investigation of properties nanometer-scale atomic devices, junctions, quantum dots and nanomachines. He has published the results of his research activities and thoughts in various scientific journals (214 articles and book chapters). In particular, Prof. Schommers is author and editor of the following books: Fundamentals of Nanometer Structuring; Structure and Dynamics of Surfaces I and II; Quantum Theory and Pictures of Reality; The Visible and the Invisible; Das Sichtbare und das Unsichtbare; Elemente des Lebens; What is Life? ; Formen des Kosmos; Space and Time, Matter and Mind; Symbols, Pictures and Quantum Reality. Prof. Schommers is the Editor-in-Chief of the Journal of Computational and Theoretical Nanoscience (www.aspbs.com/ctn). He is also an editorial board member of various scientific journals, and he is the Principal Editor-in-Charge of the book series Foundations of Natural Science and Technology. He is an invited member of the Humboldt Academy, an invited member of the Academic Board of the Humboldt Society, and an invited member of the Advisory Board of Medical Ethics of the 21th Century.